I got my hair cut here a year ago when the salon had not long opened. Returning a year later the salon is buzzing - lots of stylists and beauticians all with clients which made for a good atmosphere. I am happy to sit in a salon and not chat much as its my time to chill and it was easy to do this here. I was happy with my colour and cut. The salon is in a great location in Motherwell, easily accessible and its a 5 minute walk from my house so even better. 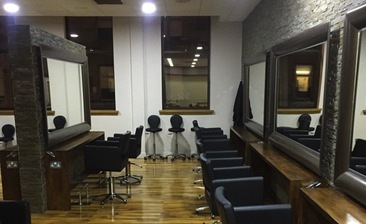 Loved the look of the salon. Was only in for a trim but left feeling happy with the length and look of my hair. The only negative I'd say is I felt like the girl washing my hair was going to rip hair out of my head a couple of times when she ran her fingers through it. But other than that, Chris who cut my hair was friendly and chatty. Would highly recommend.